Abnormal electrical activity in the brain can cause seizures. 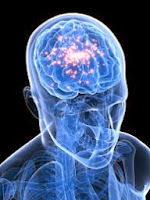 When a person has repeated seizures, this condition is called epilepsy. There are many different causes of seizures. According to some studies, between 7% and 10% of people will suffer a single isolated seizure at some time in their life.With the exception of very young children and the elderly, the cause of the abnormal brain function is usually not identifiable. In about seven out of ten people with epilepsy, no cause can be found. Among the rest, the cause may be any one of a number of things that can make a difference in the way the brain works. Head injuries or lack of oxygen during birth may damage the delicate electrical system in the brain. Other causes include brain tumors, genetic conditions (such as tuberous sclerosis), lead poisoning, problems in development of the brain before birth and infections like meningitis or encephalitis. Brain cells use electrical signals to communicate with each other. These electrical signals are normally very carefully regulated. A seizure occurs when there is an abnormal electrical discharge of brain cells all at once. Almost all seizures stop in less than five minutes, and most in less than 2 minutes. Rarely, seizures can continue for many minutes or even hours (a serious medical emergency called status epilepticus). There are many different kinds of seizures. The symptoms of a seizure depend on where in the brain the abnormal electrical signals occur. Since different parts of the brain perform different functions, seizure symptoms can be quite diverse. A convulsion is probably the most common symptom people associate with seizures. In a convulsion, the abnormal brain electrical activity spreads over the entire brain. The patient loses consciousness, collapses, and has rhythmic jerking of arms and legs. They may bite their tongues or lose control of bowel or bladder. The patient is often sleepy and confused for some time after the convulsion stops. When the doctor has made a diagnosis of seizures or epilepsy, the next step is to select the best form of treatment. If the seizure was caused by an underlying correctable brain condition, surgery may stop seizures. If epilepsy -- that is, a continuing tendency to have seizures -- is diagnosed, the doctor will usually prescribe regular use of seizure-preventing medications. If drugs are not successful, other methods may be tried, including surgery, a special diet, complementary therapy or vagus nerve stimulation (VNS). The goal of all epilepsy treatment is to prevent further seizures, avoid side effects, and make it possible for people to lead active lives. "The decision to treat becomes a highly individualized one." When a child or adult experiences a single seizure, or appears at the doctor's office with a history of questionable events that may or may not have been seizures, the first issue is to determine what happened, whether a seizure actually took place, of what type and duration it was, the possible cause, and the future prognosis. Once this information is gathered, the next question is whether to treat the underlying condition (if one has been identified and if it is treatable), or whether to treat the symptoms by prescribing antiepileptic (or seizure-preventing) drugs. Unless the EEG is clearly abnormal, thus increasing the likelihood of subsequent seizures, physicians tend to wait until a second or even third seizure occurs before beginning antiepileptic medication. They do so because studies show that an otherwise normal child who has had a single seizure has a relatively low (15%) risk of a second one. Once the second has occurred, the risk of subsequent seizures is substantially increased. On the other hand, the risk of another seizure for a child who is neurologically abnormal, or whose EEG is abnormal, may be as high as 50-60%. In determining whether to treat, physicians consider the risk-benefit ratio, which varies according to the age of the patient and his or her activity level. Waiting to see whether another generalized tonic-clonic seizure occurs is less risky for a child living in a sheltered home environment than it is for a salesman who lives most of his life driving a car, or an elderly person with brittle bones. On the other hand, antiepileptic drugs have side effects which, while generally mild, can in some cases include liver damage and potentially fatal rashes and blood disorders. Therefore the decision to treat becomes a highly individualized one in which the risks of the treatment are weighed against the risks of the seizures. There is debate about whether or not children with febrile (fever caused) seizures should be placed on antiepileptic drugs. Current opinion favors withholding therapy for most of these children, since side effects of the medication may cause more problems than recurrent febrile convulsions. There may be instances, however, when treatment is prescribed. 1. Ask your doctor ahead of time what to do if you forget a dose of your medication. 2. Don't stop taking your medicine suddenly. It could cause non-stop seizures that would put you in the hospital and might even threaten your life. 3. Tell your doctor if you notice any unusual changes in health, feelings or behavior when you are taking your medicines. 4. Be careful about drinking alcohol. Check with your doctor about how these drinks will mix with your medicine. 6. Think about things you want to ask before you see the doctor. Write them down so you don't forget. 7. Keep follow-up appointments. You may need to have special tests from time to time to make sure the medications you take aren't doing anything to your body that might be damaging. 8. Tell doctors planning surgery for you, or treating you for other medical conditions, that you have epilepsy and what medicine you take for it. Write down its name and dosage and keep it in a safe place. 9. Ask your doctor if there are any cold pills, fever medicines or other drug-store products that you should not use because you take epilepsy medicine. 10. If your doctor changes your medicine, don't drive until you know how it's going to affect you. If you witness a convulsion, try and prevent the patient from hitting his or her head on any sharp objects nearby, such as corners of furniture. DO NOT place your finger (or anything else) in the person's mouth! The common fear that a patient may "swallow his or her tongue" is just an old wives' tale. The only thing you can accomplish by putting something in the patient’s mouth is injuring yourself, the patient, or both. 1. Keep calm and reassure other people who may be nearby. 2. Don't hold the person down or try to stop his movements. 3. Time the seizure with your watch. 4. Clear the area around the person of anything hard or sharp. 5. Loosen ties or anything around the neck that may make breathing difficult. 6. Put something flat and soft, like a folded jacket, under the head. 7. Turn him or her gently onto one side. This will help keep the airway clear. Do not try to force the mouth open with any hard implement or with fingers. It is not true that a person having a seizure can swallow his tongue. Efforts to hold the tongue down can cause injury. 8. Don't attempt artificial respiration except in the unlikely event that a person does not start breathing again after the seizure has stopped. 9. Stay with the person until the seizure ends naturally. 10. Be friendly and reassuring as consciousness returns. 11. Offer to call a taxi, friend or relative to help the person get home if he seems confused or unable to get home by himself. There is only one thing I would like to add, you or your family member might be an epiletic. But there is nothing to be saddened about. Most of it could be treated. The only thing to do from your part is accept it and make the right decision.